What is Nonprofit Excellence Institute (NEI)? 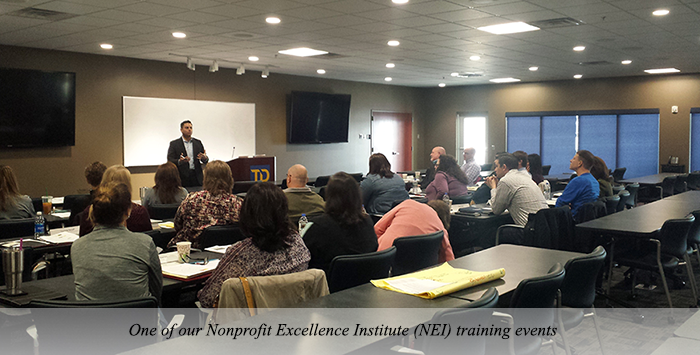 NEI is a year-long capacity building program for regional nonprofit organizations. Executive Directors meet monthly with Mary Lee Fitzsimmons of Mission Matters, a group of professional advisors who provide capacity building training and coaching. Quarterly board leaders join the executive directors for sessions designed to engage the board in capacity building for their organizations. Please see application for exact 2019/2020 meeting dates . NEI will take your organization from good to great! Giving nonprofit organizations in the Grand Island area an opportunity to participate in valuable training without the typical costs (tuition, travel, time) associated with this caliber of training. There is a nominal fee for organizations outside of Hall County. Upon successful completion of NEI, Hall County nonprofit organizations will be eligible to receive a grant of up to $5,000 to assist in further capacity building within their organization. What are the requirements for organizations to participate in NEI? Will this be worth your time? How do you maximize your nonprofits impact? Applications Open – February 1, 2019. Applications for Class 4 (Funders Year) are by invitation only. Please contact Amy Price at aprice@gicf.org with any inquires. Applications Due – March 15, 2019 by 4 p.m.